Dental handpiece maintenance is critical for us, after all, dental handpiece is expensive and relatively friable, gently take and put is necessary. 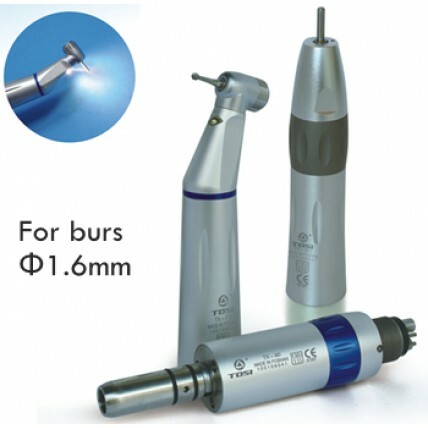 Because the resin frames between the dental handpiece and wind round ball is more afraid of wrestling, while it is also more expensive for repair, so take caution. It is best to avoid the bump in the transfer process, be sure to clip needle clip firmly, and before and after the two clamp spring force should be uniform, not in order to put the needle forward exploration lengthen this will hurt clip spring, in the need to use an extension bur reed relatively cheaper than the clip. Dental handpiece should be promptly cleaned and injected oil, when used dentist should idle for 30 seconds, so avoid keeping the oil to get into the patient mouth, although oil is now harmless, but if the fill operation getting the resin surface, the effect will be poor. Periodically turn on maintenance and cleaning. When the dental treatment is completed you’d better remove the dental handpiece to avoid dental handpiece knocked down on the ground broke when patient left the chairs; rise the operating table after complete to drain the water in the pipe completely, in the evening operating table can be placed handrails on leveraging in order to reduce the burden on the arm to increase the service life, maintenance of dental equipment online is very important for us, after all these must be out from the profits, or it is better to carefully use for extended life. Que puede ocasionar fallos en las turbinas dentales? What Is an Dental Ultrasonic Cleaner for Dentist Office?